I chose pretty pink flowers with velvety brown baby’s feet nestled safely in them because when I first saw Louise with her beautiful new baby girl I felt that her little girl could not be in the care of a more adoring or loving mother and granny. 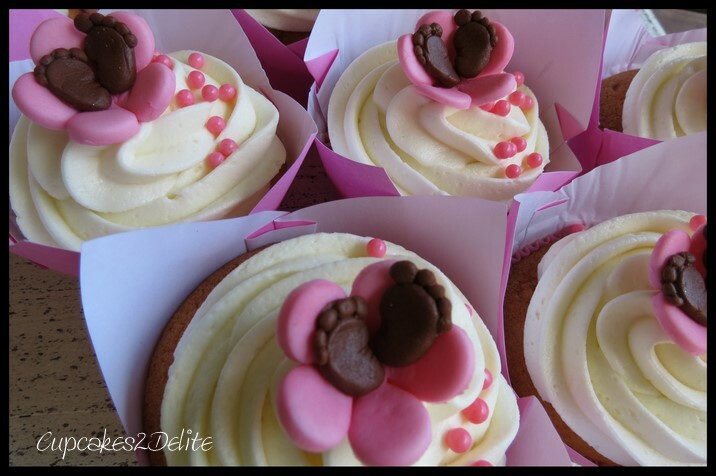 Lisa ordered these cupcakes to celebrate the arrival of Louise’s baby girl into her life and it was appropriate to use a girly pink for the flower and a velvety brown for the feet. We all wish you many joyful hours of kissing your baby’s beautiful feet as you watch your child learn to walk and then to run and of course to dance. Have fun Louise and enjoy this precious journey! ….for a cute little baby! Oh wow, Louise is truly blessed to have these delightful little treats lovingly baked for little G.
Thanks so much Desire and it is a delight to hear how much joy her little girl has brought into her life!